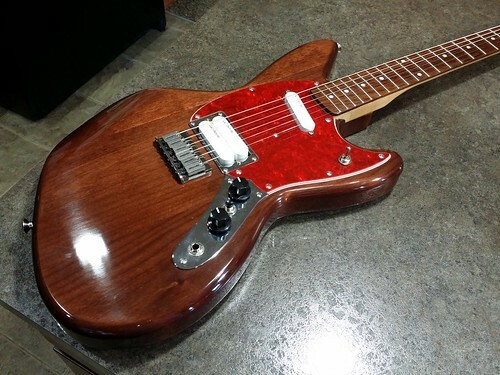 ShortScale :: View topic - Full Scale Custom Walnut Stained Jag-Stang! 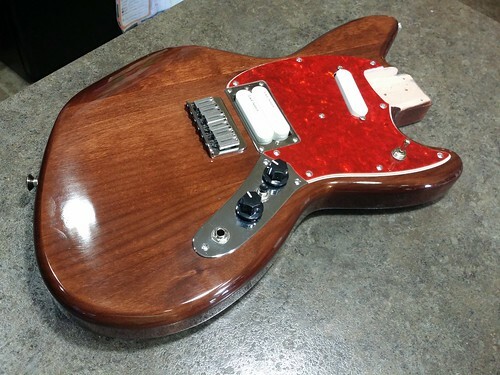 Full Scale Custom Walnut Stained Jag-Stang! 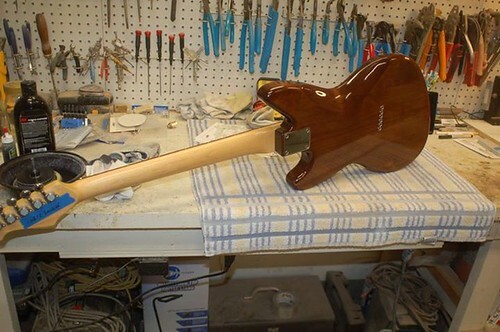 That is gonna be a sweet axe. Thanks! 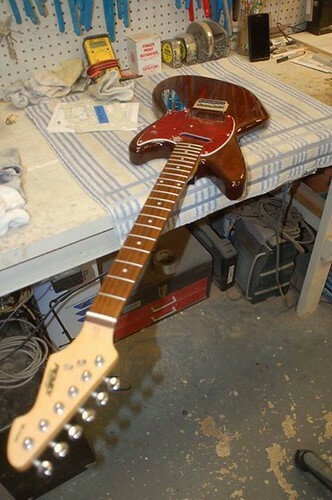 I can't wait for it to be done so I can assemble it and hear how it sounds. Looking very nice. How many J-S pickup combos have you tried at this point? Which were the best? 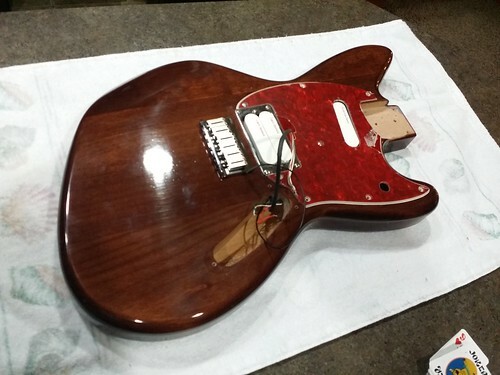 So far: several normal ones with single neck and humbucker bridge. 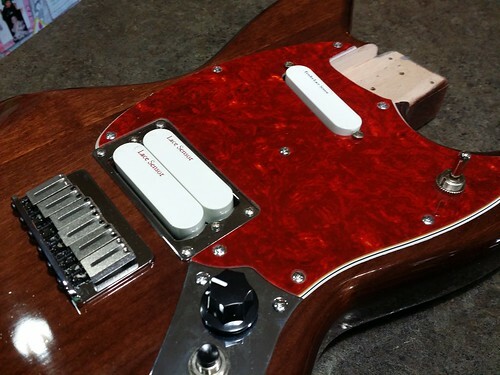 Currently my favorite bridge pickups are super distortions or jb's with 1 meg pots because I dig the treble. 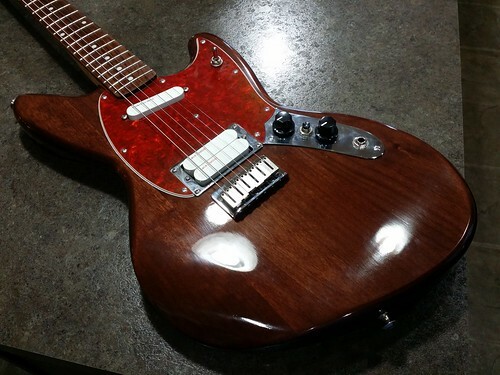 I had one with a mini humbucker neck pickup and single coil bridge. It was ok. I don't really seem to enjoy mini hums. What I am liking most about these is the contour added to the body shape (Which I like.) and the flat bridge. 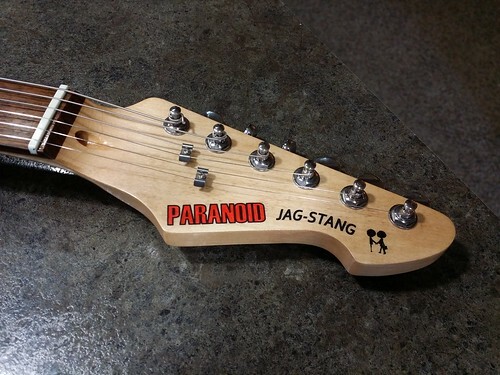 The mustang tremolo system is cool, but the tube kind of gets in the way sticking up so high. 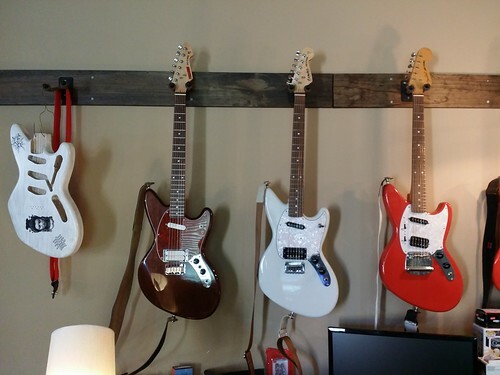 Even t.o.m's and mustang/jazzy bridges stick up a bit. These hardtail bridges are so low, my hand never hits them. 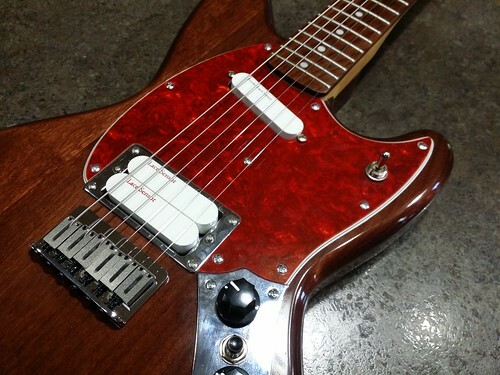 I can rest my arm on the body easily and play any spot by the pickups. Kind of cool. 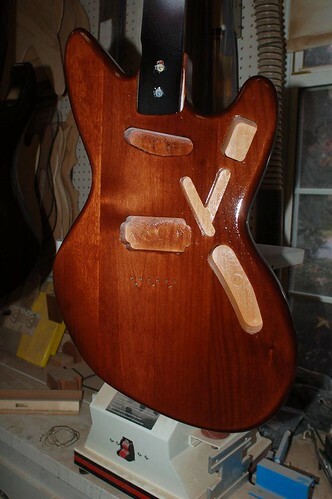 I have a three strat pickup one in the works. 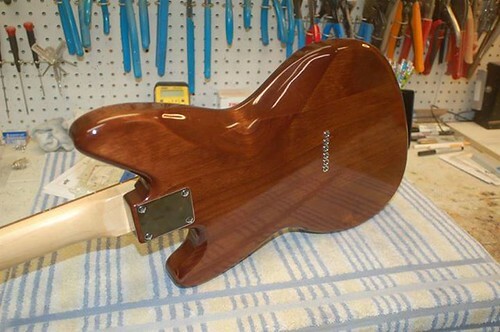 I always liked how a strat sounded, but not a strat body shape. Will see how this goes. 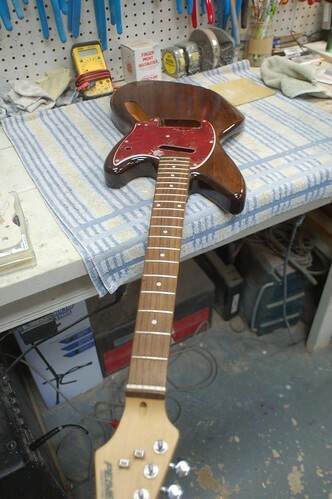 With this guitar, I am super excited about the possibility of s jagstang like guitar with the sound of my tele plus. Newest set of images gave me the "wow" impact. I was kind of nervous when I saw the first stain image because it looked kind of flat and like a chocolate bar. 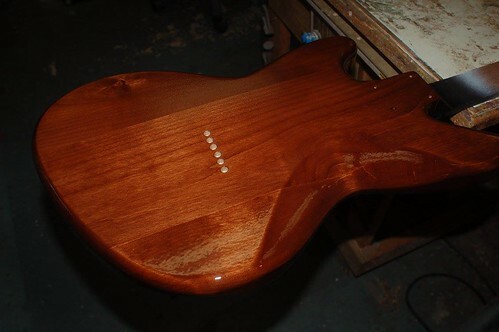 The sealer and gloss has made a huge difference. A different brown than I was thinking. (Was going for Costello brown.) I think it is pretty gorgeous and very warm looking for sure. With my custom guard he made and the neck. 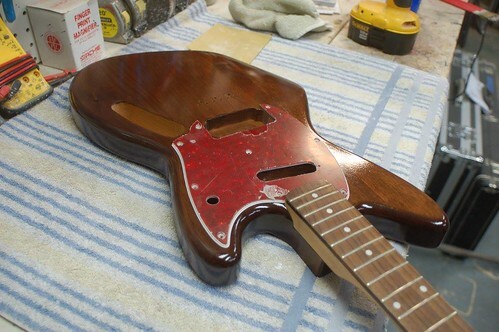 Damn, that walnut stain looks sick. 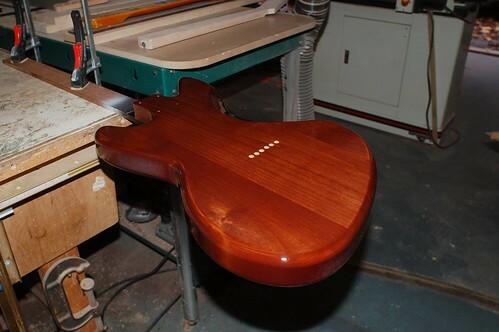 Any reason you didn't use actual walnut lumber? Builder's choice? It came back from Scott a couple days ago but I was busy with the white Jag-Stang. I got it unpacked and got to work. 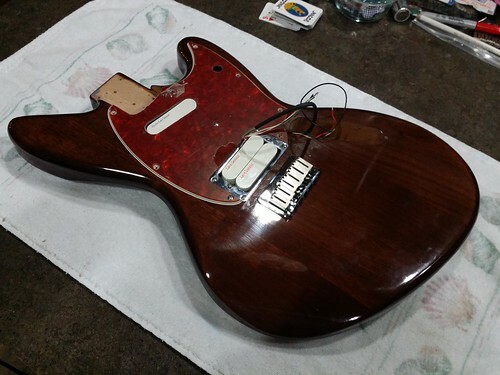 I got the guard filed a bit for the humbucker ring. I mounted the metal humbucker ring. 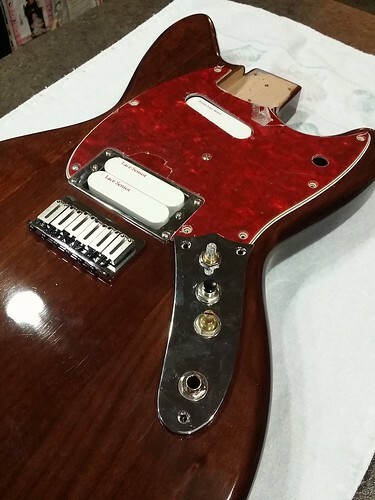 I also had to drill the humbucker rout a little for the height adjustment screws. (They were bottoming out.) 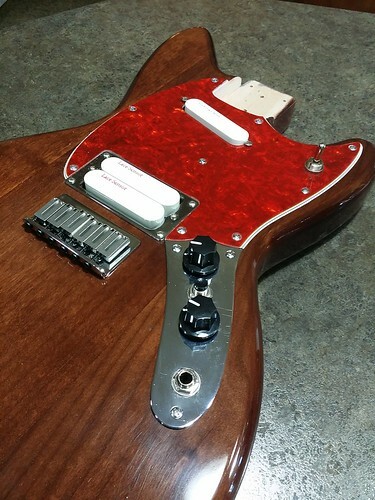 I also had to adjust the neck pickup mounting holes in the pickguard. They were too small. I also drilled my control plate for the kill switch. Looking pretty good! 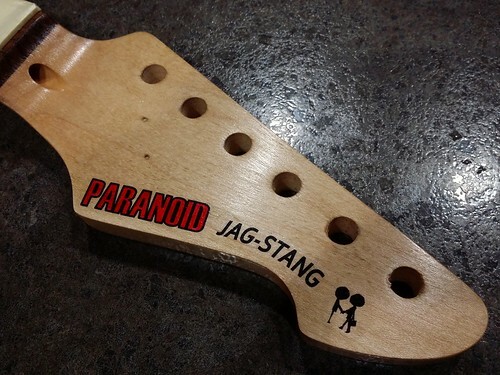 I also sanded the headstock to get rid of the old Peavey Generation logo so I can add my own. I got the wiring done! I also added the strap buttons. 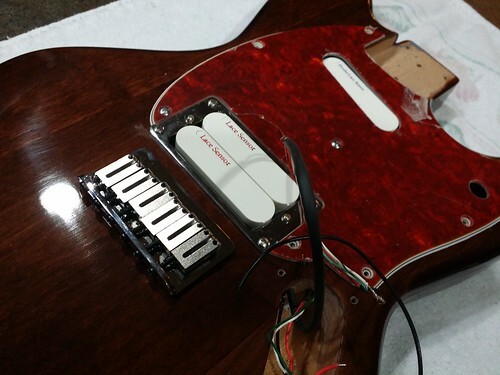 The volume is a push pull to tap the humbucker. 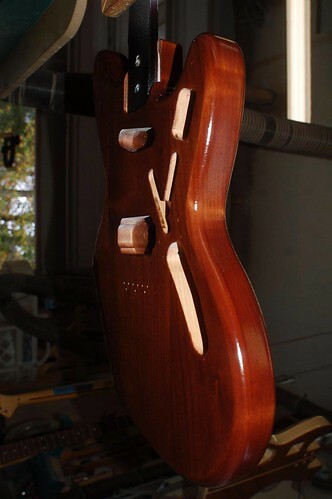 The toggle is like a duo-sonic. Heavy duty clicking. I also have the customary kill switch between the pots. 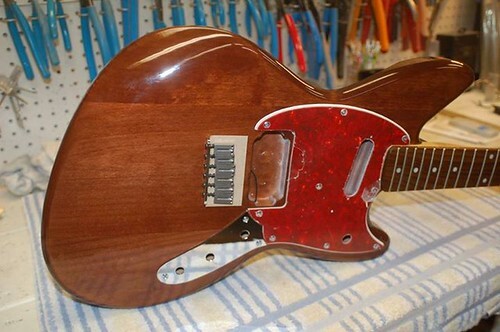 The tone pot is a TBX one to be like a Telecaster Plus. 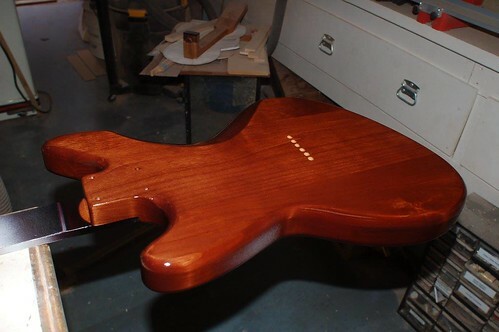 Just need the headstock done to get it all together. 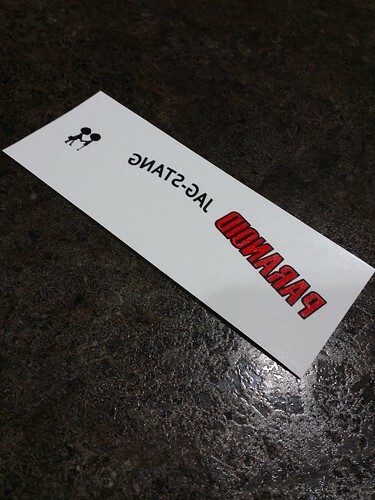 The red on the decal turned out great. 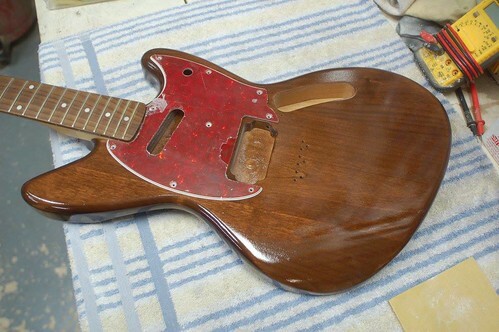 Matches the pickguard really well. looking really ace there. 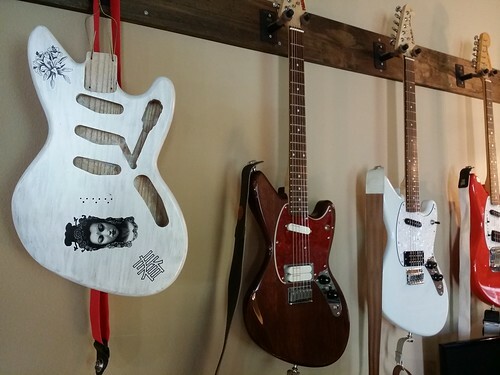 what kind of tuners are you going with? That is ace. If I saw someone rocking that on stage, I would be super impressed. 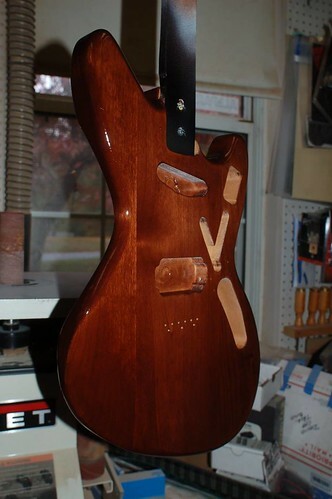 The tort and the walnut are perfect together. The stock ones it had worked nicely, so I am just going to put those back on. 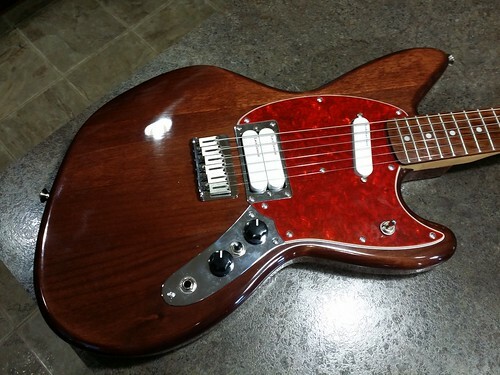 What is with the screw that is placed dead center between the picks ups on the pickguard? 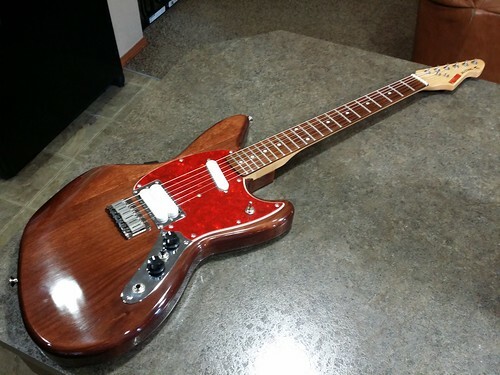 Is it need to keep the pickguard from flexing? 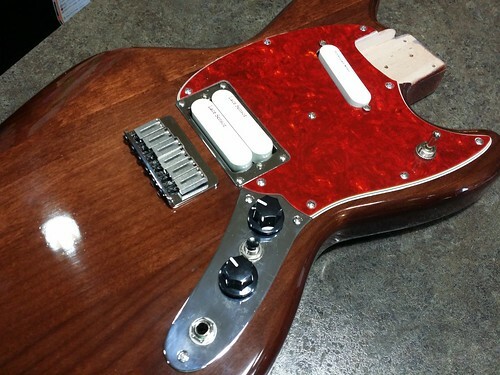 Is it even a screw or is it just light reflecting off the pickguard? It is a screw like Mustangs have. 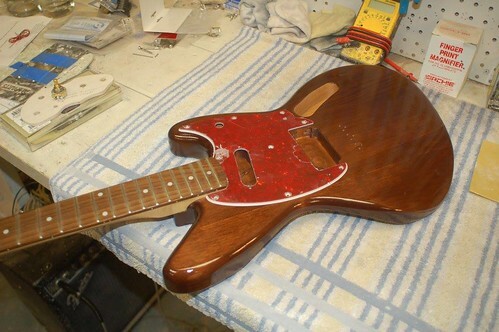 I wanted it there to reference a Mustang pickguard. Hanging next to prototype 1.0. 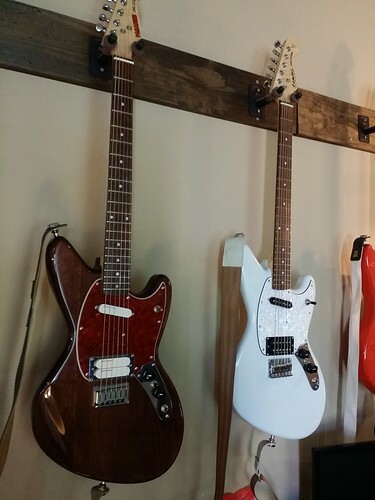 Customs next to standard Jag-Stang. Found a 0.05" Allen Wrench in the garage and got it tuned up and intonated. I am super happy with how it sounds. The TBX helps brighten it up a lot. 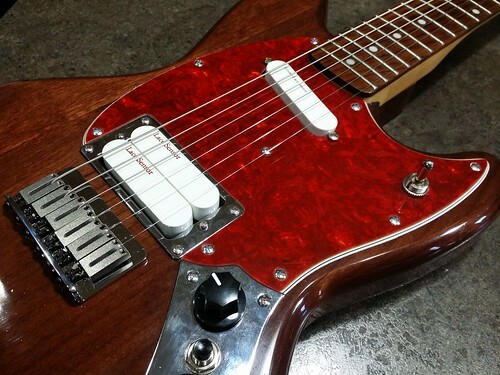 The push pull with the humbucker gives a totally different sound. I like it a lot. It works great! 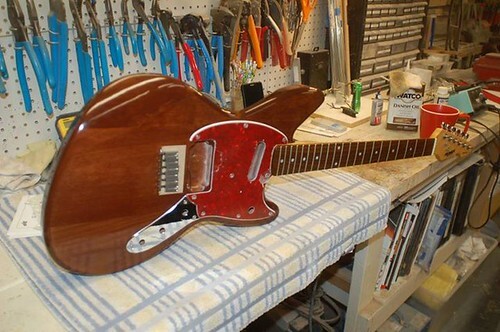 FYI it does sound like my telecaster plus... but is more comfy with the contours.